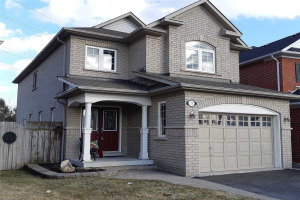 Elegant Detached Medalion Home 4Br & 3Wr, Located In Desirable Neighborhood Of Whitby. Built 2016, App 2638 Sq.Ft, 11'Ceiling On Main Floor, Pot Lights, 3-Way Fireplace, Fully Upgraded Open Concept Kitchen & Light Fixtures With 2 Chandeliers, Ss Appliances, Counter-Top Stove, B/I Oven & Microwave, Granite Counters, Master Br 10' Ceiling W/O To Balcony, Bdrms 9' Ceiling, Huge Driveway, Main Flr Laundry, Builder Finished Recreation Room In Basement. $$$$ Spent On Upgrades, Hardwood Flrs, Ss Fridge, Ss Counter-Top Stove, Ss B/I Oven & Microwave, Ss Dishwasher, Washer & Dryer, Central A/C, Gas Fireplace, Electrical Light Fixture Medalion Built Home, As Per Seller App 2638 Sq Ft.